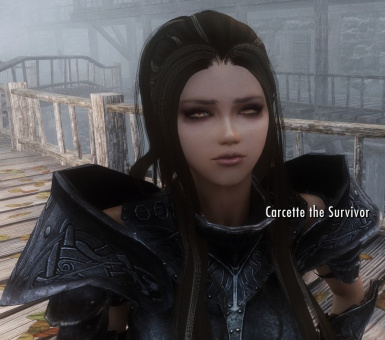 This mod helps provide an explanation as to what happened to Keeper Carcette after the attack on the Hall of the Vigilant. She is now a follower and marriable. This also helps to make Stendarr's Beacon more aesthetic, functional, and immersive. Lastly, this also adds vigilants to all major cities and most settlements. SNNR Option. You may NOT upload this elsewhere!!! Doing so will royally tick me off, and I will go straight to whoever hosts the website to report the stolen material. I've done it before, and I'll do it again if need be. steve40 for giving me alot of good advice toward this mod. DonProtein aka Sinitar Gaming for featuring my work on youtube, and supporting my efforts. Don't forget to give kudos and endorsements to your mod authors and their mods! 154 endorsements and rising, heh. Make sure to tell your friends! Short Description: Ever wonder whatever happened to Keeper Carcette after the attack on the Hall of the Vigilant? 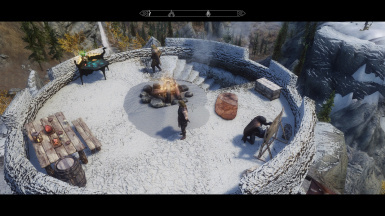 This mod helps provide an explanation as to what happened and helps to make Stendarr's Beacon more aesthetic, functional, and immersive. Lastly, this also adds vigilants to all major cities and most settlements. 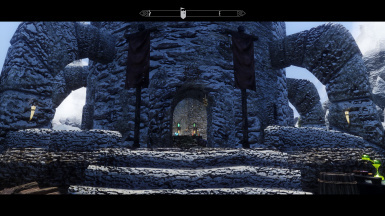 It makes the Vigilants of Stendarr appear to be "getting their act together" after the attack, trying to turn Stendarr's Beacon into a new headquarters, and to make their presence felt across Skyrim. SNNR Patch available. 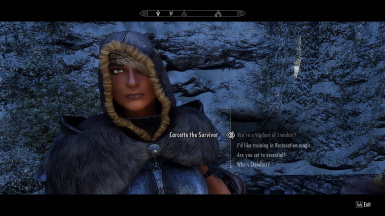 - Keeper Carcette is now alive and well after the attack, stationed at Stendarr's Beacon. She is a follower, eligible for marriage, and a fully functioning expert restoration trainer now. - Stendarr's Beacon was given a nice makeover. Added decorations, furniture, crafting stations, idle markers, and more npcs. - Vigilant of Stendarr Quartermaster is a merchant npc at Stendarr's Beacon, who sells a variety of things to the wanna-be Vigilants out there, including a silver sword with a custom enchantment on it. 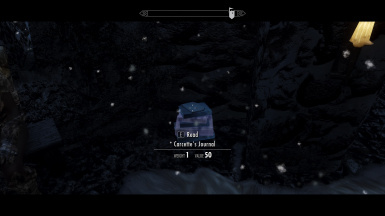 - Carcette's Journal, which can be found inside Stendarr's Beacon, gives her backstory in-game, and reveals several vampire lair locations. - During the night; Carcette, her dark elf bodyguard, and Stendarr's Little Helper will patrol the route between Stendarr's Beacon and the entrance to Dayspring Canyon. 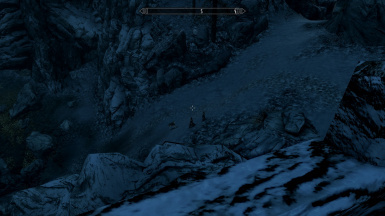 This gives the impression that the Vigilants are now supporting the Dawnguard, and aggressively guarding the route to the Beacon. 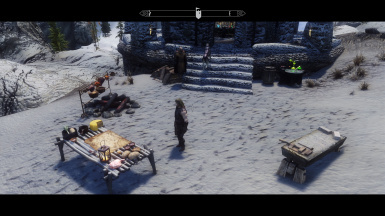 - You will find 2 Vigilants of Stendarr in every major city now, and a single one at any settlement with a tavern. By day, they travel to taverns, temples, and alchemy shops. By night, they keep watch over the city for suspicious activity. They are the eyes and ears of the order, and provide valuable night time protection to cities and towns. They try to act natural, as to make city guards not overly aware of their presence. However, they also fully function as city guards too. 23 total, not counting the ones I added to the Beacon. 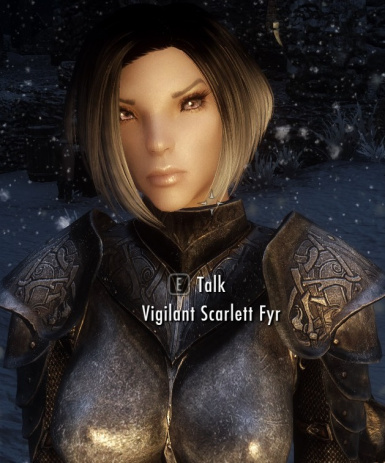 Explanation - Mods that add guards in the form of Dawnguard, tend to do so as if Dawnguard were actual city guards. 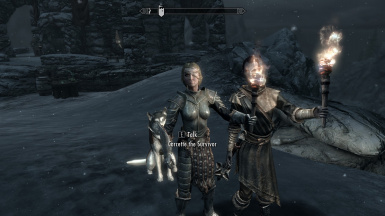 I doubt the jarl would grant jurisdiction to the Dawnguard, or anybody other than his guards for that matter. So, instead of my Vigilant guards just standing around or going on obvious patrols, I have them acting like normal citizens instead with full ai schedules. It's all about the immersion baby. - Yes, I specifically decided to release this mod the day after Easter. Keeper Carcette has been resurrected after all, heh. 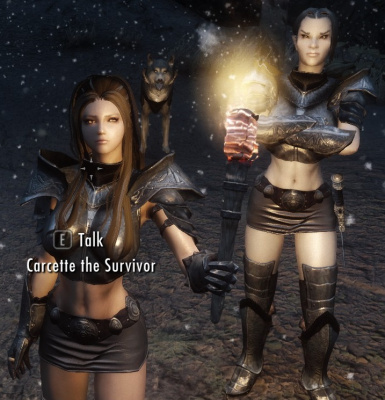 - When Carcette is acting as a follower, her bodyguard and Stendarr's Little Helper will also tag along. 3 followers for the price of one. With the vampire lair locations from the journal, you'll be all set to go adventuring with your Vigilant squad! - This mod is a location makeover + extra enchantment + small squad + waifu + extra city guards + Guild HQ + a murder mystery solved....all in one. - The SNNR Patch will turn the new Carcette into quite a cutie! Requires SNNR to work correctly. Works with 2.0 and 3.0 Beta. - Optional 3.0 Beta: This is an unpolished version being uploaded early for willing bug testers. This is a HUGE update. New scriptless healing/buff system. 3 new Heal/buff spells work on the Player, Followers, Marriable NPCs, Vigilants, Dawnguard, City Guards, and crime reporting citizens. Buffs include bonuses to 1H, 2H, Archery, Block, Heavy/Light Armor, health/stamina regen, magic/poison/disease resists, and unarmed damage. 1 new Command Undead spell (only works on summoned undead). 2 new banish/expel undead spells (only works on summoned undead). Before, vampires had a 50% chance to spawn with a spell that allows them to re-animate dead bodies. Instead of the other 50% not getting a spell, they now gain the ability to summon undead without dead bodies present. This will make vampire combat slightly harder, but this is balanced by the new spells. Dragon Priests will also utilize command undead, making combat more difficult for necromancers. The changes to vampires and dragon priests are done through specific leveled spell lists. This ensures compatibility, as Wyre Bash can merge list changes! There are 2 new banish/command undead staffs. 6 new silver banish undead weapons. 7 new "shield" spells (Morrowind/Oblivion Throwback); Fire, Frost, Shock, Wind, Light, Night, and Poison. They are basically upgraded expert level cloak spells that improve armor and have various other benefits. Some of the new spells can only be gained by completing "Wind and Sand" for Talvas Futhryon. There are also unenchanted versions of all the religious necklaces now, so players can enchant them themselves. I also improved the look of Carcette's bodyguard, making her a custom NPC named Vigilant Scarlett Fyr. The SNNR Patch works just fine for 3.0 as well. There are probably a few other changes, I'm just going through my notes from a few months ago. 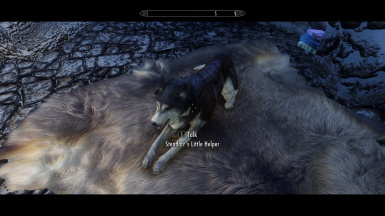 This mod is considered Beta, even though 99% of it works fine. I recall having some trouble getting Carcette to heal/buff for the group, but that is more than likely due to it's unscripted nature and how the AI uses spells. The player can heal/buff others just fine. Some of the shield spells may need testing too, but most of them are working just fine too. All spells and such have been integrated fully into Skyrim and it's DLC via leveled lists, therefore, a Wyre Bash patch is now a requirement to ensure compatibility with other mods that alter the same lists. - 2.0: There are 2 versions. One without the scar and head bandage, and one with. Made Carcette into a follower and able to be married. Created a custom enchantment, put it on a silver sword, and added it to the list of items the Quartermaster will sell. Created a journal which gives Carcette's backstory after the attack, and reveals several vampire lair locations. Added some floor furs to help make the top of the beacon cozier. 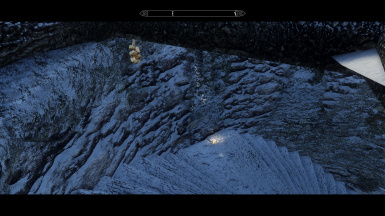 Moved a snowberry wreath for Stendarr's Beacon Enhanced compatibility. Added more Vigilants to cities, and added one to each small settlement with a tavern. Tweaked a lot of various things to make this mod better. Created SNNR Patch. - 1.1: The new Carcette now has separate facegendata. She now sports a scar that fits well with her head bandage. Download with NMM and Install. To try out the 3.0 Beta, just install it over 2.0 normal. SNNR Patch: Must install Normal Version 2.0, and SNNR first. SNNR's esp is only required if you want the original Carcette at the Hall and many other NPCs beautified. Otherwise, you just need the assets for the patch to work. - Mods that add silver weapons to level lists. 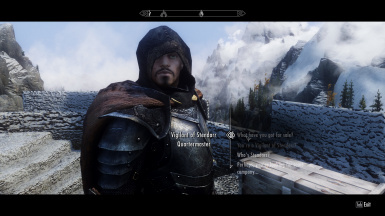 - Mods that add additional enchantments to level lists. 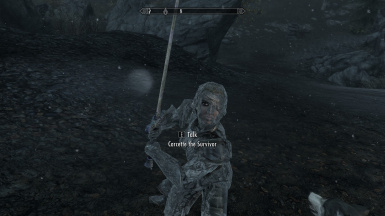 - Mods that add to your Vigilant roleplay experience. She has a lot more skill perks than Vanilla Carcette. Heavy Armor, Restoration, Alteration, Two-Handed, and Block. Her custom class makes her skills a lot better. She knows a lot of defensive spells. Ironflesh, Circle of Protection, Greater Ward, Close Wounds, and Heal Other. Her boots carry a vanilla resist frost enchantment. 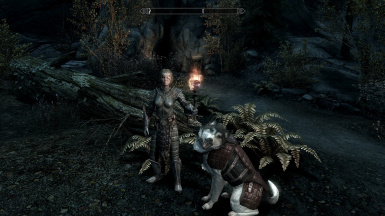 Her cuirass carries a vanilla restoration enchantment. Her gauntlets carry vanilla two-handed damage enchantment. Her ring carries a vanilla magic recharge enhantment. Her amulet fortifies block and armor, increases health regeneration, resists magic, and generates a ward while blocking in combat. 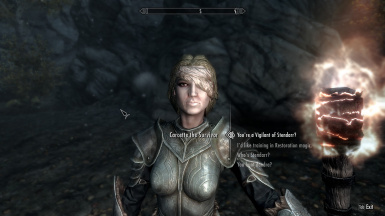 Her silver greatsword does fire and shock damage, while also utilizing Banish, Turn Undead, and the new custom enchantment: Stendarr's Fury. The player may not take her amulet or sword, but I would recommend tempering her armor, or enchanting your own to give to her. She is a self-healing tank, and an anti-magic wrecking ball toward undead and abominations. Perfect in a variety of situations. What does this new custom enchantment do? Stendarr's Fury. It works a lot like the enchantment on the Poacher's Axe from Halted Stream Camp. However, instead of leveled damage against animals, it does it to Daedra, Undead, Werewolves, Werebears, Gargoyles, Hagravens, and Wispmothers. It's a restoration based enchantment, so it should benefit from the perks in that skill tree, like necromage. 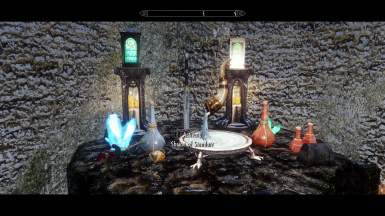 Compliments enchantment effects from mods like Wintermyst or Summermyst. The idea behind the enchantment is that it's a holy-type of offensive enchantment. Effective against anything daedric or necromantic in nature. Hagravens actually fall into this category, as they are the worst kind of witches who became a daedric creature like a werewolf. You could almost call them "Were-ravens". No navmeshes were harmed in the making of this mod. Cleaned with TES5Edit for good measure. floydwanderer for helping me iron out the SNNR patch via testing.